It is now possible to add the luxury of heated seats to virtually any vehicle at a reasonable cost. 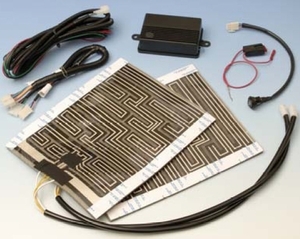 This product was designed specifically for vehicles that did not come from the factory with heated seats, or for consumers who want to add heaters in the back seat. The seat heater's elements warm up quickly, supply heat within 60 seconds to both the seat and lower back area of any seat in the vehicle. Price is for 2 elements for the bottom and back of one seat.